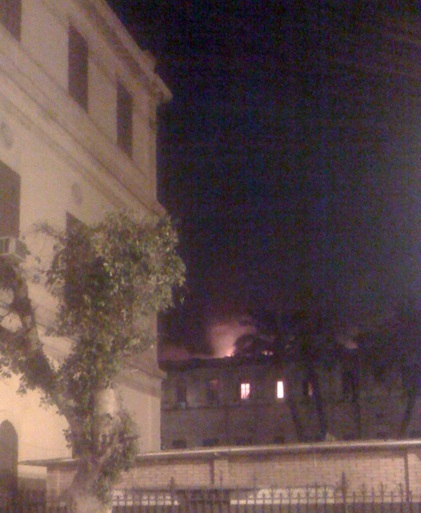 Fire broke out yesterday at Egypt‘s Shura Council, the upper house of the Parliament of Egypt at around 16:00 local time. The number of injured had reached 13. Officials said that most of the casualties were a result of smoke inhalation and minor burns. As of this article’s publication, thick black clouds of smoke could still be seen billowing from the three-story building in downtown Cairo. A statement had been broadcast over a local TV network indicating that the evacuated employees said authorities told them they had ruled out terrorism and that the fire has been a result of a short circuit. Fire engines and military helicopters reached the fire location and began trying to extinguish the flames. Ambulances were also seen in the area. Parts of the ceiling on the top floor collapsed due to the fire. The Egyptian Taxation building had also caught on fire.